Spring is the best season to visit Japan because of the cherry blossom. And also between late April and the beginning of May is one of the busiest period. It is called “Golden Week” in Japan. April 29, May 3, 4, and 5 are National holidays. I recommend you to avoid travelling on those days. It’s not surprised if trains are full. Fall season is very popular to travel in Japan. Fall foliage is amazing. Weather is very nice. It’s highly recommended to train in this season. 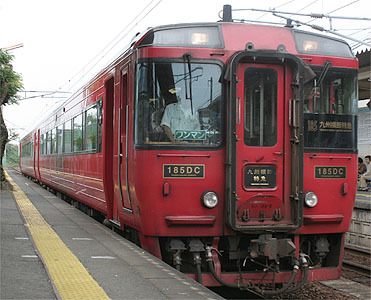 Many seasonal trains will run during this season. I show you seasonal trains information mostly for September, October and November, 2014 in this post. Spring is the best season to travel. The cherry blossom can be seen throughout Japan from late March to late April. And also between late April and the beginning of May is one of the busiest period. It is called “Golden Week” in Japan. April 29, May 3, 4, and 5 are National holidays. If you can, lease try to avoid travelling on those days. Many trains are almost full. In spring season, the busiest period is late April and the beginning of May. It is called “Golden Week” in Japan. April 29, May 3, 4, and 5 are National holidays. If you can, lease try to avoid travelling on those days. Fall is good season to travel in Japan. JR Group operate lots of seasonal trains during this season. But it is too many to introduce all seasonal trains. So I pick up the popular trains and are operated in the popular spot. JR Kyushu announce that they will introduce the newest limited express train, “A Ressha de Iko” (A列車で行こう=Take the ‘A’ train) on October 8, 2011. They will operate two round trips of this train on weekends, holidays and Christmas holidays between Kumamoto (熊本) and Misumi (三角). This train stops at only Uto (宇土). The timetable has not been announced yet. I will let you know right after I get.